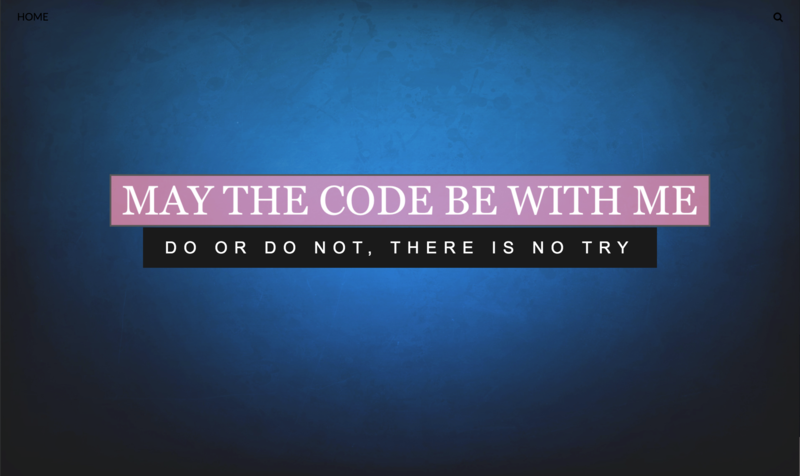 May The Code Be With Me! I am a journalist turned Product Owner in Stockholm, Sweden. Since 2015, I've worked with the digital development of Dagens industri, and since 2016 Dagens industri and Dagens Nyheter. 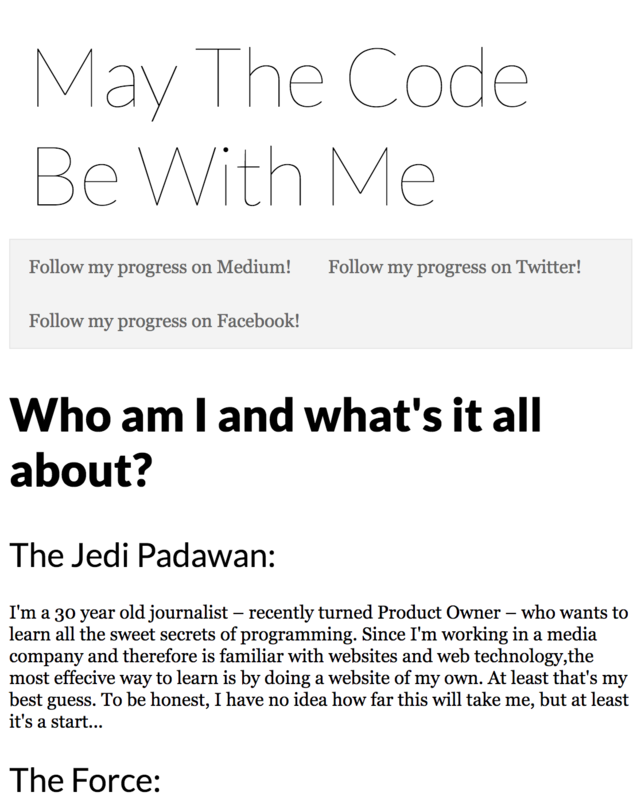 I launched the May The Code Be With Me project on May the 4th 2016 with a simple mission: learn markup and some basic programming. Release date: May 6th, 2016. The first truly visual version of the website. ”As you can see, all I’ve done is adding a background color, a short info text and a link to my publication on Medium,” I summarized it in a Medium story. Release date: May 11th, 2016. The first HTML5 version of the webpage. ”Recently, I decided to go rogue with some fresh HTML5 instead of threshing obsolete HTML from the mid-’90s. 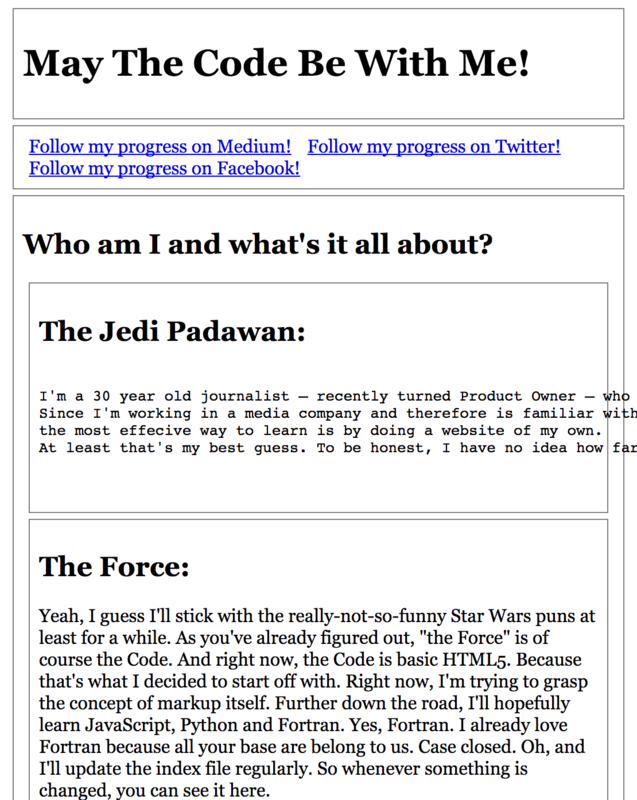 Goodbye crappy turquoise background website, hello HTML5 skeleton,” I summarized it in a Medium story. Release date: May 16th, 2016. The first CSS3 styled version of the webpage. The markup and CSS was fairly simple, but I did learn how to fetch external fonts (in this case Lato by Łukasz Dziedzic) with the link rel="stylesheet" command. ”It’s actually quite amazing what 21 lines of CSS can do to a site,” I summarized it in a Medium story. Release date: May 29th, 2016. Versions 1.0.5 and 1.0.6 were minor updates to the 1.0.4, but with 1.0.7 I turned it up a notch using W3 School's Parallax Template. ”Even though I didn’t create any of the fundamental parts myself, it has helped me reached a greater understanding of how certain 'tricks' or techniques are used to accomplish something that at first glance seems very complicated,” I summarized it in a Medium story. Release date: July 23rd, 2016. You have entered brutalized space. 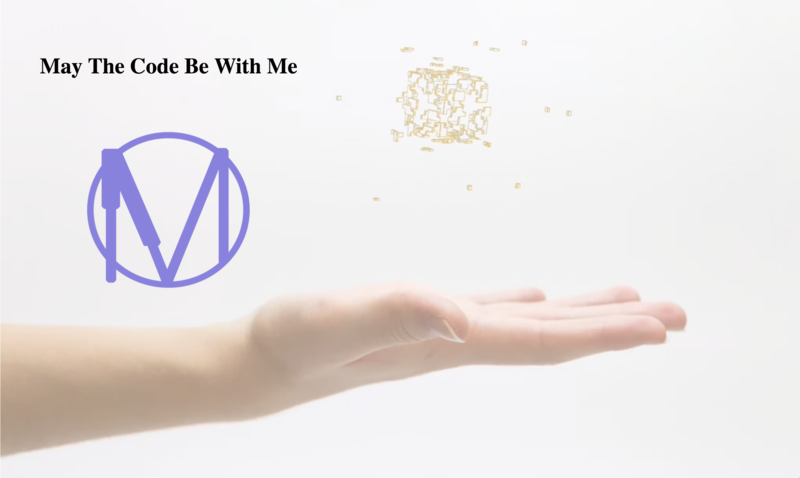 ”The more I read about brutalism, the more clear it got to me: I have to make a brutalized version of May The Code Be With Me. [...] mainly because I figured that creating a website this way would improve my understanding of HTML and CSS,” I summarized it in a Medium story. Release date: June 14th, 2017. Before making a completely new website, I needed a stopover. ”During my Medium absence, I’ve started a complete makeover of the website twice. The very first thing I did was a redesign of the logo,” I summarized it in a Medium story. 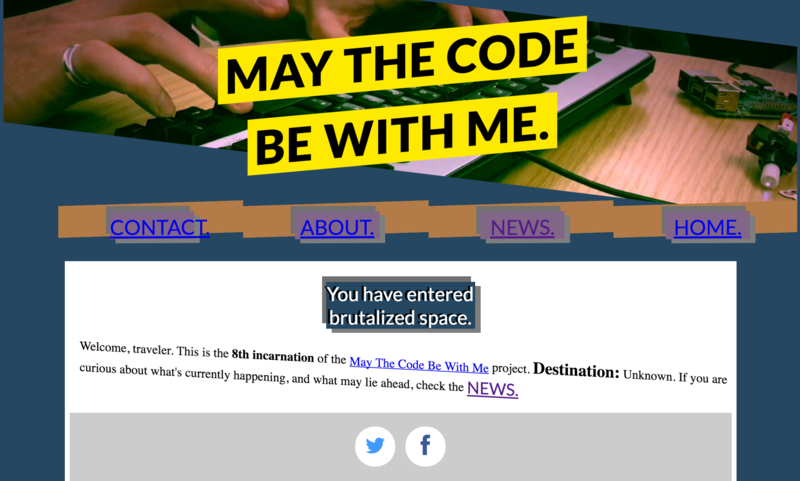 The current version of the May The Code Be With Me website, version 3.0, is based on WebSlides created by José Luis Antúnez. I've used the Landings demo as base and made a few customizations of my own. I started out just exploring the concept of HTML slides, but eventually decided that I wanted to make a version of my website only using WebSlides. I highly recommend it – the markup is really neat and readable. Thank you José!